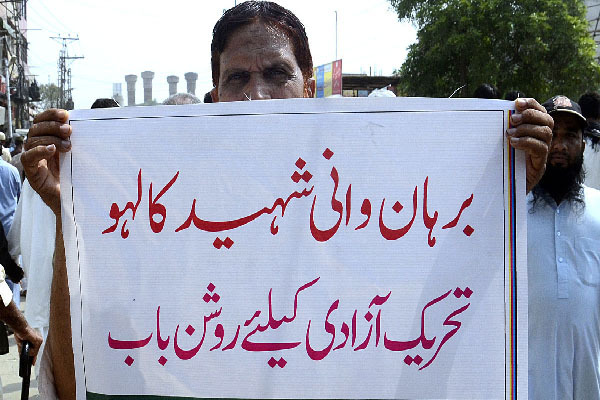 LAHORE, July 15 (APP): Pakistan Sunni Tehrik (PST) on Friday observed protest day across the country against the atrocities of Indian army in occupied Kashmir and terrorist blasts in Saudi Arabia. Workers of PST Lahore staged a protest demonstration outside Data Darbar Bhatti Gate after Juma prayer to express solidarity with Kashmiris and against atrocities of Indian forces on innocent Kashmiries. A large number of PST workers participated in the protest. They carried banners and placards inscribed with different slogans against atrocities of Indian forces. Addressing on the occasion, PST City leader Maulana Mujahid Ghulam Rasool and other speakers condemned the killing of Kashmiris in occupied Kashmir. They urged international community to take notice of use of force in Indian-held Kashmir by Indian army. PST, Ulema Board and Ulema Mushaikh also passed condemn resolutions in mosques.